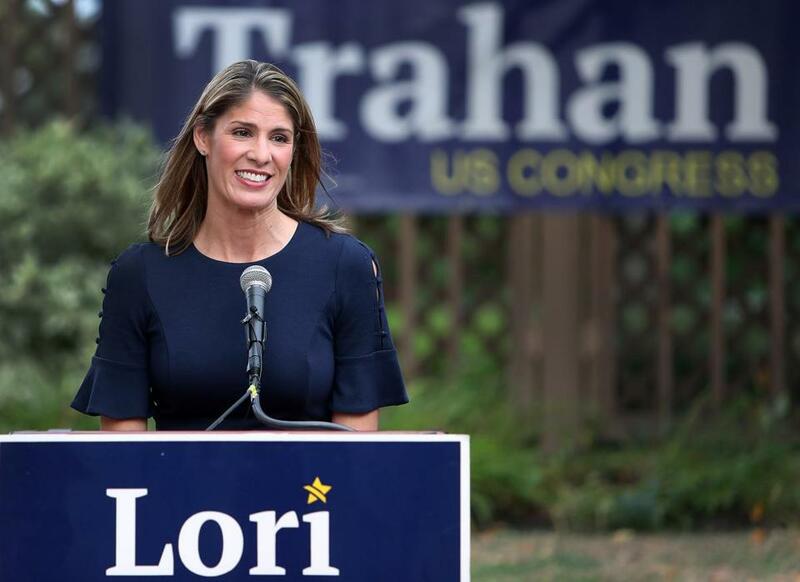 Ending nearly two weeks of uncertainty, Lori Trahan emerged Monday as the Third Congressional District’s Democratic nominee when a recount confirmed her place atop the 10-Democrat primary by a fraction of a percentage point. The long-delayed finish came after runner-up Dan Koh, who had requested the recount, questioned the “credibility” of the results in Lowell, the district’s largest city, but ultimately conceded Monday afternoon after falling behind Trahan by 145 votes among the 89,000 that were cast. The slim margin — the two were separated by 0.17 percent — pushed Trahan, 44, a Lowell native and former congressional chief of staff, into the general election contest with Republican Rick Green, an auto parts magnate from Pepperell. Mike Mullen, an independent candidate and IT director from Maynard, is also on the Nov. 6 ballot. “I could not be more proud to stand before you here tonight, finally — officially — the Democratic nominee for Congress in the Third District. We have a lot of work to do,” Trahan said at a press conference in Lowell, in what was essentially her third victory speech since election night. Trahan said Monday that Koh called to offer her his support before the secretary of state’s office released official figures in the districtwide recount showing she topped the field with 18,580 votes. The recount’s tally actually expanded Trahan’s initial 122-vote lead after the Sept. 4 election. She is expected to appear Tuesday at a Democratic unity rally in Lowell alongside Koh and Representative Niki Tsongas, who’s retiring from the Third District seat. Koh’s concession put an end to a chaotic, 10-Democrat primary, which was the largest field for a congressional race in Massachusetts in 20 years. Trahan, who once served as a top aide to former representative Martin T. Meehan, had declared victory both on election night and in the days afterward, saying she was confident she had a built a big enough lead over Koh. But amid days of uncertainty about the certified results, both campaigns collected signatures to force a potential recount, with Koh ultimately making the request. A five-day recount ensued across the district’s 37 towns and cities, including Lawrence and Lowell, where officials completed the hand tally while under the supervision of Secretary of State William F. Galvin’s office. Galvin last week said he was taking control of the elections departments in Lowell and Lawrence. He said administrative errors in Lowell meant that a “significant number of precincts did not reconcile or had missing information” for the Sept. 4 primary. In Lawrence, Galvin cited staffing issues for his move. Koh dispatched a letter to Galvin last week asking him to hold off on the recount in Lowell — the municipality in which Trahan received the most votes — until the secretary completed an investigation. Ultimately, Trahan gained 72 votes — and Koh added 27 — in Lowell after the Sunday recount. Throughout the process, Trahan has sought to turn the focus to the general election, holding a “Women for Lori” event before the recount started in which she touted the support of three of the other female candidates in the Third District’s field of Democrats. She now officially enters the fold with exactly seven weeks until the election. “One of the reasons why we did the event that we did last Saturday with the women in this race was to not skip a beat, to build a strong campaign, to continue raising money . . . so we’re well-equipped for this general election,” she said. Green, meanwhile, launched a splashy campaign ad last week, promising to better fund the region’s infrastructure while jumping into the Merrimack River. The 47-year-old, who did not face a primary opponent, has also emphasized his business experience — he cofounded 1A Auto, an auto parts company — and sought to frame himself in a Monday statement as someone more focused on “fixing things instead of fighting” in Washington. Green is well-known in political circles as the founder of the fiscally conservative advocacy group Massachusetts Fiscal Alliance, which has regularly attacked the records of Democratic state lawmakers. In her remarks, Trahan labeled Green a “well-financed Republican opponent who looks forward to being another voice” for President Trump. But when pressed, she admittedly was not wholly familiar with the extent of his campaign messaging.